London St. Pancras station was, for many years, synonymous with the 'Peaks'. Towards the end of the type's reign of supremacy on the Midland Main Line 45142 stands under the famous arched roof with the 0005 for Derby on 28th September 1986. 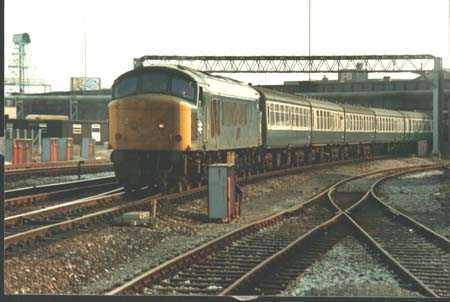 The type were also employed on North East/South west cross country turns as depicted below with 45113 arriving at Burton-on-Trent. At this time trains of this length were commonplace, rather unlike the now standard seven vehicles to be found on NE/SW services! 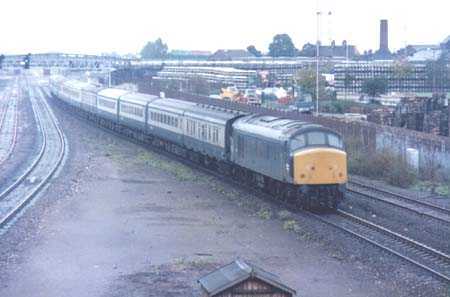 Summer dated trains on the NE/SW routes tended to produce vast rakes of Mark 1 vehicles, here 46052 drifts into Derby on 18th September 1982. 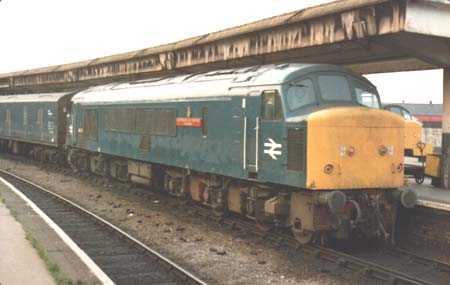 Curiously only one Class 46 was ever named, 46026 was named "Leicestershire & Derbyshire Yeomanry" in April 1962. 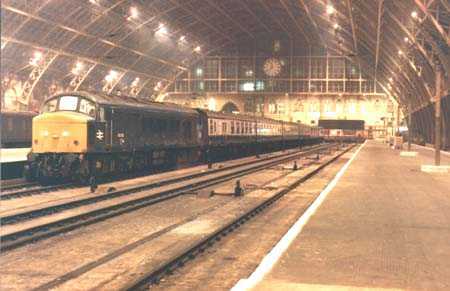 That having been said when 46035 was transferred to departmental use the name 'Ixion' (meaning the ever turning wheel) was applied. 'LADY' as 46026 became known is seen (below) at Derby on parcels duty on 13th July 1983.